The porch of your home is the first impression for every visitor and it must be up to date, clean and inviting. 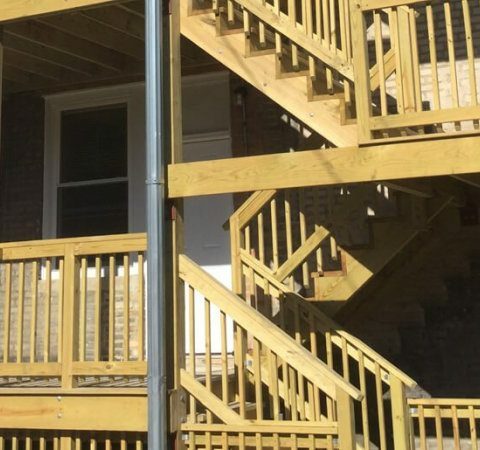 Lumber One has constructed several new porches and also repaired the old ones. Instead of repair and renovation, a new construction is a good idea but we always recommend what is best for our client in terms of durability and budget. Our aim is to enhance the look of your house by making the front entrance eye-catching and modern. While keeping the structure and stability our main point of concern, the design and décor of the porch must cohere with it. We initiate the project by analyzing the existing conditions of the porch. Based on our recommendations, the client either opt for repair or new construction. Our designers carve out the best possible options that fall under client’s budget. The work is initiated after the client’s approval. We remain open to all sorts of new ideas from our client during the construction phase as we are there just to keep our client happy and satisfied with our work. Installation of new porch requires skilled workforce. Our team is trained and has been able to successfully follow the complex requirements of installation. With Lumber One, you can trust the porch floor to be durable and lasting. Our materials are of high quality and we do not compromise on excellence. We make sure that starting from a tiny nail to heavy hardware products used in porch installation are of superior quality. This makes our work outstanding and long lasting. Every other day, there is a new range of materials, colors, flooring tiles and hardware products to choose from. We keep abreast about the latest trends and fads. We keep on searching for the most latest and popular themes that can make the construction unique and beautiful. Our designers and craftsman keep on bringing the new ideas and designs to the clients. This makes the clients to choose the most modern and updated designs. The efforts of our team are well appreciated as they are concerned to give the best possible outcome. In Porch construction, repair or renovation; the abidance of codes and violations is of utmost importance. We make sure that our team is well aware of the codes and violations and strive to follow the rules right from the start. At the time of inspection, our team members are present and often the inspection is a success and approval to continue is got instantaneously. We keep on transferring knowledge regarding codes and violations and previous inspection details among team members so that important points are never missed. We value the experience of our old team members who give useful advises, recommendations and help in knowledge transfer.